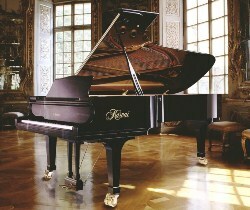 A grand piano is made up of over nine thousand precision parts... wood, metal, fibre resin, and other materials. Just assembling them into the mere form of a grand piano is, by itself, an immense undertaking. But the process of crafting those parts into a precision instrument capable of translating the subtle expressions of the soul into the language of music...creating an instrument that can truly sing...is an art. At Kawai, each EX Concert Grand is created to be a musical masterpiece that exists not for itself, but to fulfill its destiny as an expressive extension of the artist. At the lofty pinnacle of Kawai artistry, the EX Grand is one of the worlds finest instruments, patiently built by Master Piano Artisans to translates artisitc intentions into musical reality.